Air Asia Promos 2019 to 2020: P5 base fare for December promo! 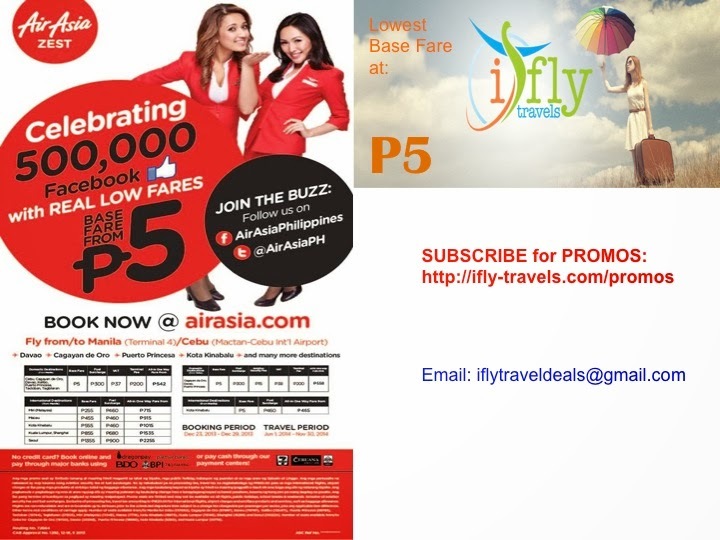 P5 base fare for December promo! AirAsia Zest Promo: Here it is! We cannot thank you enough for making us 500K strong! So we’re throwing an awesome treat for all of you! P5 base fare sale to our destinations! Enjoy Cagayan de Oro, Cebu, Davao, Kalibo (Boracay), Puerto Princesaand Tagbilaran (Bohol) from as low as P872 all-in fare; and Kota Kinabalu, Kuala Lumpur, Miri, Macau, Seoul (Incheon) & Shanghai from as low as P715 all-in fare – all from Manila (Terminal 4). Also, from Cebu (Mactan Internatinal Airport), you can fly to Cagayan de Oro, Puerto Princesa & Davao from as low as P544; and Kuala Lumpur & Kota Kinabalu from as low as P465 – everything’s all-in! So be sure to avail our treat for you, our dearest 500k fans & counting! ‘Share’ this with your family and friends and together, let’s be redder, hotter & stronger AirAsiaPhilippines! Our heartfelt thanks once again!